Acquired cystic kidney disease happens when a person's kidneys develop fluid-filled sacs, called cysts, over time. HOW COMMON IS ACQUIRED CYSTIC KIDNEY DISEASES? Almost 60 percent of people on dialysis for 2 to 4 years develop acquired cystic kidney disease. About 90 percent of people on dialysis for 8 years develop acquired cystic kidney disease. Tumors in the kidneys. People with acquired cystic kidney disease are more likely than people in the general population to have cancerous kidney tumors. However, the chance of cancer spreading is lower in people with acquired cystic kidney disease than that of other kidney cancers not associated with acquired cystic kidney disease, and the long-term outlook is better. Ultrasound uses a device, called a transducer, that bounces safe, painless sound waves off organs to create an image of their structure. 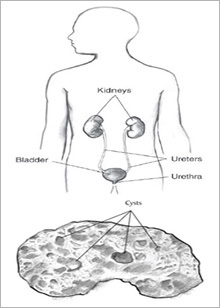 The images can show cysts in the kidneys as well as the kidneys' size and shape. Computerized tomography (CT) scans use a combination of x-rays and computer technology to create images. CT scans can show cysts and tumors in the kidneys. Magnetic resonance imaging (MRI) is a test that takes pictures of the body's internal organs and soft tissues without using x-rays. The technician will take a sequence of images from different angles to create a detailed picture of the kidneys. A person may prevent or delay some health problems from chronic kidney disease (CKD) by eating the right foods and avoiding foods high in sodium, potassium, and phosphorus. Learning about calories, fats, proteins, and fluids is important for a person with advanced CKD. Protein foods such as meat and dairy products break down into waste products that healthy kidneys remove from the blood.